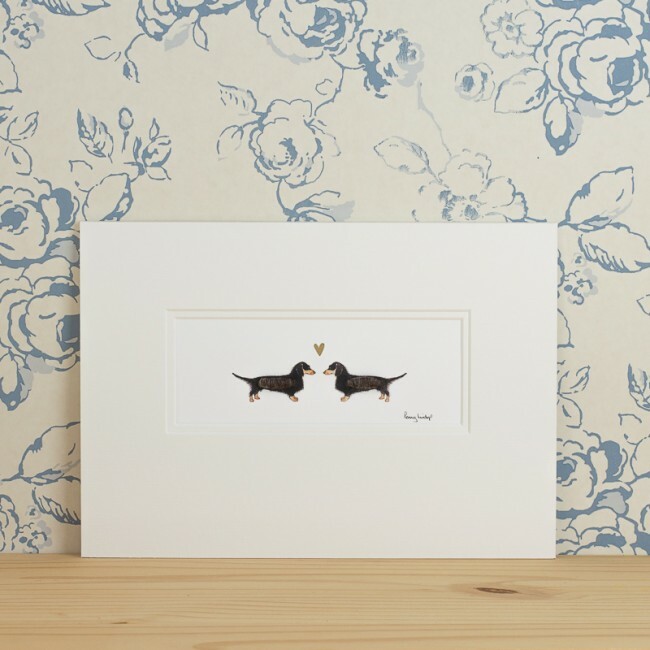 Our dachshunds in love print is a perfect wedding or anniversary gift for dog lovers. It is especially apt for everyone who loves dachshunds, wedding or no wedding. 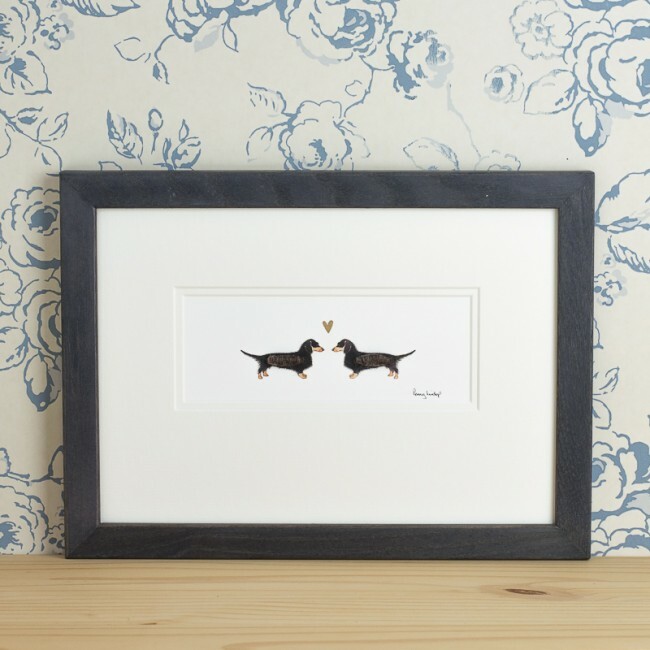 Give a little piece of quirky dachshund art to help spread the love of dachshunds. All who have encountered dachsies and have been bewitched by them, know that they are small dogs with big personalities. 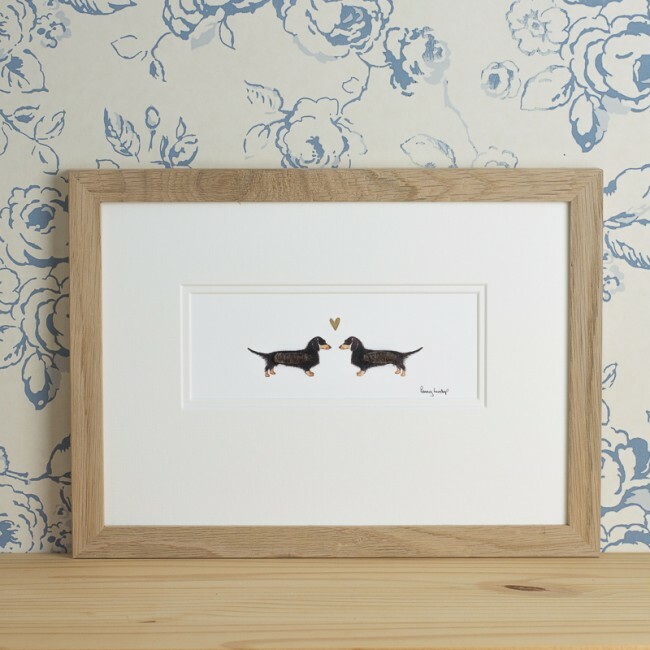 And so it is with this small picture of 2 dachshunds in love. The dogs have been given a little fluffy body, using real sheep's fleece. This is a touch that adds gentle humour and brings smiles to faces. 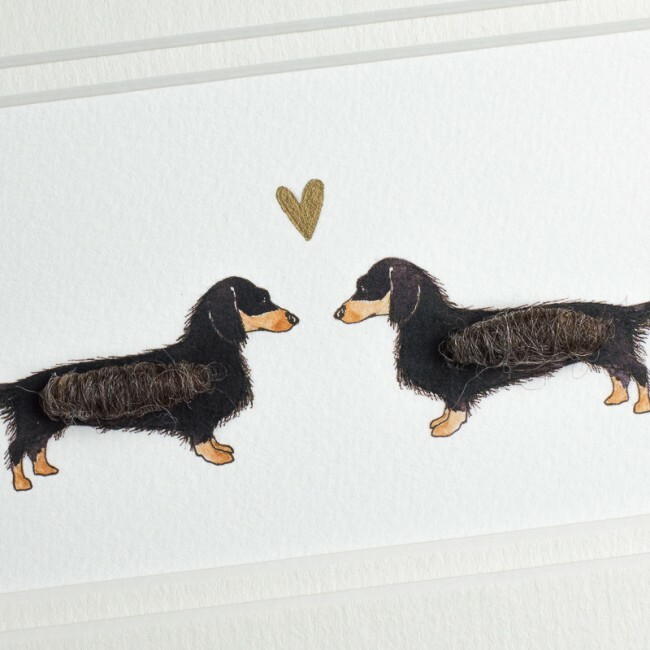 We hand draw a little gold heart above the 2 dogs, symbolising the love between them. A perfect anniversary or wedding gift - possibly the best wedding gift if you choose to have the picture personalised. We would be happy to personalise this picture for you - the text will be hand written in pencil beneath the 2 dogs. 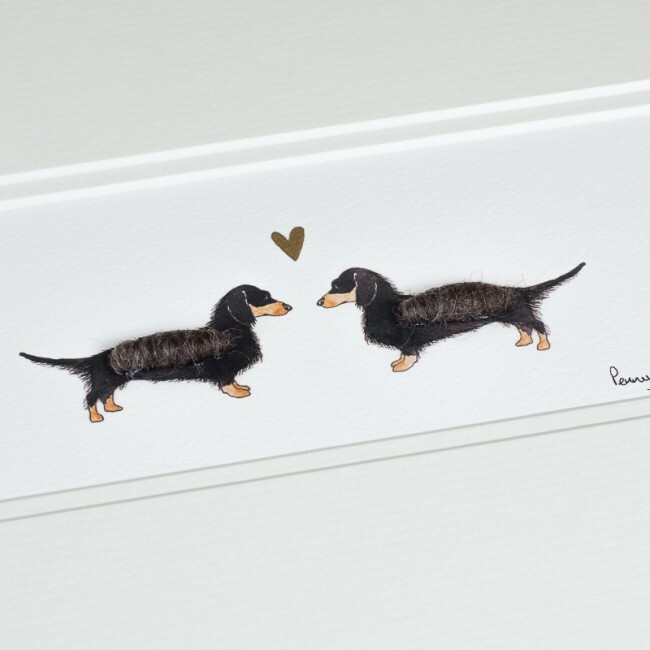 Perhaps you would like the picture as a keepsake of 2 particular dachsies – we could write their names underneath Or perhaps this is the ideal engagement, wedding or anniversary gift. You may like us to write the owners names, and perhaps the significant date. Or perhaps you want something completely different.... The choice is yours, but please, just ask us to write a short one line as space is limited. We print the artwork on an acid free archival quality paper which is made in the UK. Mounted in a double mount of conservation quality which we believe adds an extra touch to the finished print. Mounted picture size is a standard A4 size (297 x 210 mm) - it is very easy to find a frame to fit this but we are happy to frame it for you if this would help. We offer a natural oak or a grey stained ash frame. We frame to a high professional standard, taping the back up and attaching proper framing thread for hanging.